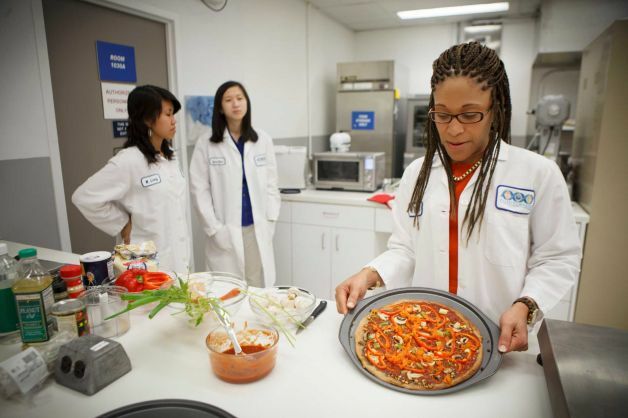 Scientist Maya Cooper demonstrates a Mars-ready vegan pizza (Credits: Michale Stravato/AP). NASA has been feeding astronauts in space for years. Space food has evolved from the nutritious but unappetizing meals first designed by pet food nutritionists to today’s ISS menu consisting of dozens of prepackaged canned and dehydrated dishes, customized for each astronaut and flavored with specially designed flavoring sauces. Yet menu fatigue remains a concern for astronauts, particularly those on long duration missions. Partially, this is due to the necessarily repetitive nature of prepackaged meals. But it doesn’t help that physiological changes make it difficult for spacefarers to smell their food, making for bland-tasting dishes. Now, with planning for a potential crewed trip to Mars underway, NASA’s Advanced Food Technology Project is considering how to alleviate menu fatigue on the 18 month journey to and from the Red Planet. The simplest approach to feeding astronauts on a Mars mission would be the same way ISS crews are fed now: load up their ship with prepackaged meals. This approach has drawbacks however. Aside from the aforementioned fatigue, foods would need to be developed with shelf lives years longer than the current 2 year standard to avoid spoilage during the trip. The mass allotment to carry all that food would also be a disadvantage. The Advanced Food Technology group is considering alternatives in its Johnson Space Center laboratory. A trip to the Martian surface offers some flexibility over orbital missions, since Mars’ gravity could allow visitors to chop vegetables and boil water. This opens up a whole new area in space food research. The lab’s primary focus right now is development of a greenhouse option. This would entail astronauts growing their own vegetables, allowing them to prepare a wide variety of vegan meals on their own. “That menu is favorable because it allows the astronauts to actually have live plants that are growing, you have optimum nutrient delivery with fresh fruits and vegetables, and it actually allows them to have freedom of choice when they’re actually cooking the menus because the food isn’t already pre-prepared into a particular recipe,” says Maya Cooper, the Lockheed Martin senior research scientist leading the project. The psychological value of freedom of choice and self-preparation is one of the areas under investigation at the Hawaii Space Exploration Analog and Simulation (HI-SEAS) scheduled to begin in 2013. Cooper’s team has developed about 100 recipes that could be followed on Mars. The team has also analyzed the amount of time and resources needed to cook each menu. With a maximum use of the greenhouse approach, a single astronaut might need to be dedicated to food preparation full-time. More likely, however, is some balance between prepackaged and freshly cooked meals.